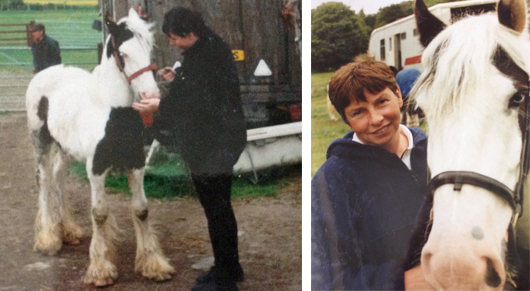 Twenty-year-old piebald cob Flynn has been reunited with his original rescuer after 14 years apart. Flynn was first rescued by Christine Sullivan from a horse sale when he was only six months old. He was incredibly underweight and suffering from a large hernia that was causing him a lot of discomfort. Through her dedication and loving care, Christine nursed him back to health with the hope that one day she would be able to ride him. However, when Flynn started his training, he began to show sign of distress when ridden that led to unpredictable and potentially dangerous behaviour. Christine contacted Redwings in the hope that our behavioural expert might be able to help. On assessment, it was decided to offer Flynn a home at Redwings where our behavioural team could help him overcome his handling issues as well as provide him with a home for life where he would not need to be ridden. Last winter, Flynn was chosen for a very special job within the Sanctuary; to be a companion for blind horse Boo after the sudden and tragic loss of his former companion and “sight-horse”, Oliver (read the full story here). Thankfully, Flynn was introduced to Boo and soon helped him overcome this loss by providing a calm and reassuring presence, and they now spend their days grazing happily together. This summer, Christine travelled from Leeds to our headquarters in Norfolk to be reunited with Flynn after 14 years apart. And what an emotional reunion it was! Christine was overjoyed to see Flynn and delighted to see that her original efforts to nurse him back to health had been worthwhile. 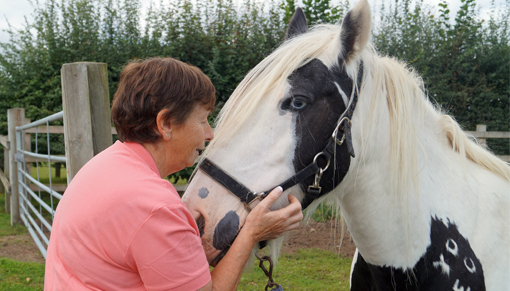 Redwings’ Chief Executive Lynn Cutress said: “We are delighted that Christine and Flynn have been reunited after all these years and to be able to show her how her hard work in his rescue and care paid off.